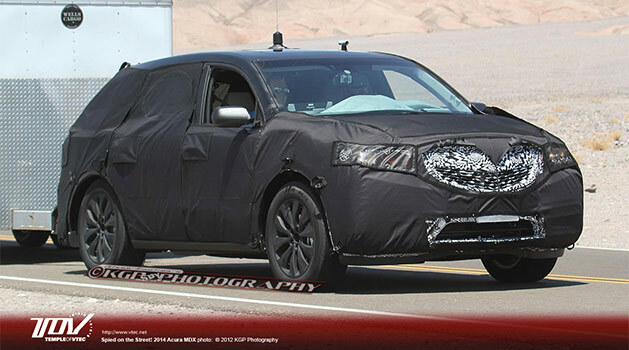 Photos of a 2014 Acura MDX test mule have recently been shot by the KGP Photography crew in America. It seems the California heat had caused it to shed some of the heavy outer camo, leaving us with a better look at the new grille, though still covered by a second layer of psychedelic camo. “Acura engineers ventured to the heat of the California desert to test a prototype for the 2014 MDX. The 120-degree heat encouraged the removal of some of the MDX’s front camouflage, giving us our clearest look yet at its grille, and lower air-intake. The new grille looks very similar to the grille-work spotted on prototypes for Acura’s all-new RLX. Notice the shape of the grille looks a bit “squared” and less sharp than some of the current Acura models. Have a look at the full set at Temple of VTEC – vtec.net.